Love those leaf earrings, Sally. They are beautiful. Lovely earrings! I have tried to sell too, in a little village, and sold maybe four earrings in four hours. So I sit there just to show what tatting is, and hope that someone maybe wants to start tatting! those are all pretty items, sorry that they didn't sell. maybe Jane can add them to her etsy shop and you can sell them that way. 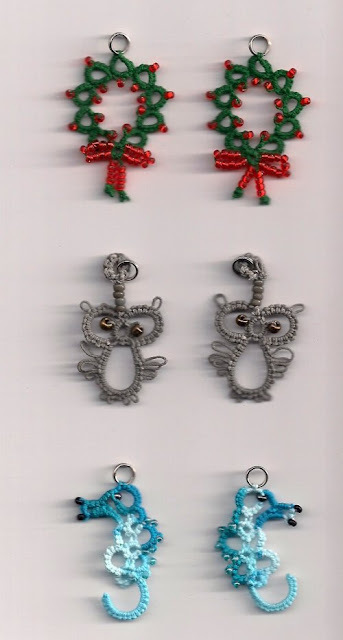 Yes, Tatting does tend to take over - especially when you are very slow at it, as I am! The earrings are very cute, shame they didn't sell. Put your earrings and things in Jane's shop. I bet they will sell. :) lovely jewelry . It's a shame that you didn't sell everything, after putting a lot of effort into making things for the fayre! I know the feeling. You have to have enough to make the table look good, but it doesn't all sell. Love the seahorses, I must look for the pattern. I have used Jane's bigger version on children's pillowcases, but these ones are cute too.